A robotic Orbital ATK Cygnus cargo ship arrives at the International Space Station on Oct. 23, 2016 to deliver 5,100 lbs. of supplies and science gear to the outpost's six-person crew. A Cygnus cargo spacecraft arrived at the International Space Station on Sunday (Oct. 23), delivering science experiments and supplies for the station's six-person crew. 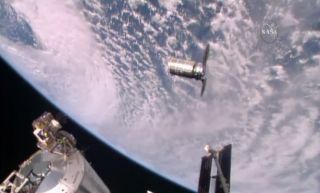 The Cygnus spacecraft was captured by the station's robotic arm at 7:28 a.m. EDT (1128 GMT) in order to be attached to an open berthing port later this morning The cargo ship is delivering more than 5,100 lbs. (2,300 kilograms) of supplies and science gear to the station. The ship is named the S.S. Alan Poindexter in honor other of the late NASA astronaut Alan Poindexter, who died in 2012. The Cygnus cargo ship launched from NASA's Wallops Flight Facility in Virginia on Monday (Oct. 17). A second spacecraft, a Russian Soyuz, launched toward at the space station early Wednesday (Oct. 20) from Baikonur Cosmodrome, Kazakhstan. It arrived at the space station on Friday (Oct. 21). Cygnus was launched atop an Antares rocket, also built by Orbital ATK. This was the first Antares launch in nearly two years; in 2014, an Antares rocket (which was also carrying a Cygnus craft to the station) exploded seconds after liftoff. Sunday's launch was not only a return to flight for Antares, but also the first flight of the upgraded Antares 230, which has two new engines in its first stage. The Cygnus launch was pushed back repeatedly, and even though the spacecraft left Earth ahead of the crewed Soyuz vehicle, "mission managers decided to let the Cygnus take its time on orbit and let the new crewmembers arrive first," NASA officials said in a statement.